Home » Our Doctors » David M. Zigler, O.D., M.S. 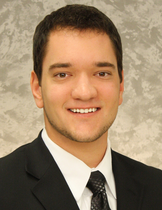 Dr. David M. Zigler is a 2014 graduate of The Ohio State University College of Optometry. Born in Upper Arlington, OH, Dr. David graduated from Miami University in 2010 with a Bachelor’s of Science in Zoology prior to his optometric education. While at The Ohio State University College of Optometry, Dr. David was part of numerous class organizations. He held position of Class Representative for the American Optometric Student Associaiton, Student Liason to the Contact Lens and Cornea Section of the AOA, Member of Epsilon Psi Epsilon Professional Optometric Fraternity, and a member of Beta Sigma Kappa International Optometric Honors Society. Dr. David was also the chief investigator for research on the subject of Corneal Refractive Therapy contact lenses and dry eye relief in symptomatic soft contact lens wearers. He graduated from The Ohio State University College of Optometry with a combined OD and accelerated Master’s degree in 2014. Dr. David will continue his interests in contact lenses and dry eye management as he begins his Optometric career. He plans to be actively involved in the American Optometric Association, the Ohio Optometric Association, and the American Academy of Optometry providing insight and ideas for the growth of the optometric community. He is currently on the board for Zone 12 of the Ohio Optometric Association helping coordinate meetings, legislative recruitment, and continuing education opportunities for it’s members. Dr. David was recently awarded title of Assistant Professor of Clinical Practice for The Ohio State University College of Optometry, for the academic year of 2017-2018. Dr. David is eager to provide each and every patient with great care and compassion, and surpass their expectations regarding ocular care and management. Dr. David is easily reached at dmzodms14@gmail.com.